A chartered train carrying dozens of GOP lawmakers to a Republican retreat in West Virginia struck a garbage truck near Charlottesville, Va., on Wednesday, lawmakers said. This photo provided by Rep. Greg Walden, R-Ore., shows the crash site on Wednesday. The University of Virginia Medical Center had this update on the injured on Wednesday evening: "One patient is in critical condition, one patient is in good condition, three patients are being evaluated, and one patient has been discharged." President Trump said he spoke with House Speaker Paul Ryan. "The train accident was a tough one, a tremendous jolt," Trump told reporters. "We don't have a full understanding yet as to what happened. But it was a train hitting a truck going at a pretty, pretty good speed. And we'll have a full report as to what it looks like the driver of the truck was killed." The Associated Press reports the man who died in the crash was a passenger in the truck. The driver and another passenger were seriously injured. 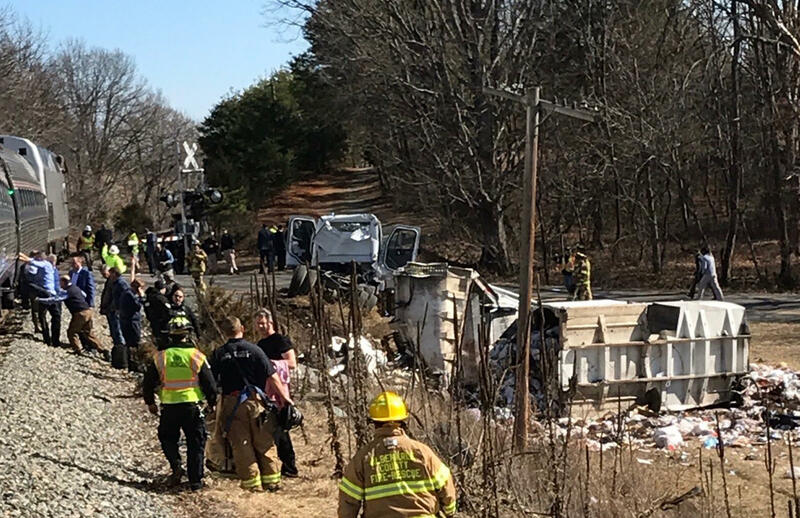 In a statement, Amtrak said the train "came into contact with a truck that was on the tracks at 11:20 a.m. in Crozet, Va." It said two Amtrak crew members and three passengers were transported to a local hospital with what were described as minor injuries. It said the National Transportation Safety Board is investigating. Arizona Sen. Jeff Flake told CNN that he was on the train near the front and got off to help. He said there was a person who "was deceased" and another person who was "pretty bad off." Flake added, "I hope he survives." Flake said another person wasn't as seriously injured and was able to walk to the ambulance. Flake said he was not sure whether those injured or killed were in the cab of the truck or were holding onto the back. Sen. Bill Cassidy, R-La., a physician, tweeted that he helped tend to the patients until emergency medical technicians showed up. "We're fine, but our train hit a garbage truck," wrote Rep. Greg Walden of Oregon. "Members with medical training are assisting the drivers of the truck." The Republican lawmakers were headed to the Greenbrier Resort in White Sulphur Springs, W.Va., for a three-day strategy retreat focused on their policy agenda and this year's midterms. They are scheduled to hear from Vice President Pence on Wednesday evening followed by a speech from Trump on Thursday. After the crash, the train returned to Charlottesville, Va., and lawmakers boarded buses to continue their journey. Ryan, R-Wis., tweeted the accident was "a terrible tragedy," adding, "we pray for the victims and their families." The Congressional Institute, which is sponsor of the retreat, said it will proceed with an adjusted program. "Our thoughts and prayers are with those impacted by today's incident." The institute said the program will now include a moment of prayer for those involved in the accident and a security briefing from the sergeant-at-arms and the Capitol Police.